Now in its 22nd year, Poets’ Night Out continues to celebrate original poetry written and submitted by residents of Antrim, Benzie, Charlevoix, Emmet, Grand Traverse, Kalkaska, Leelanau, Manistee, Missaukee, and Wexford counties. 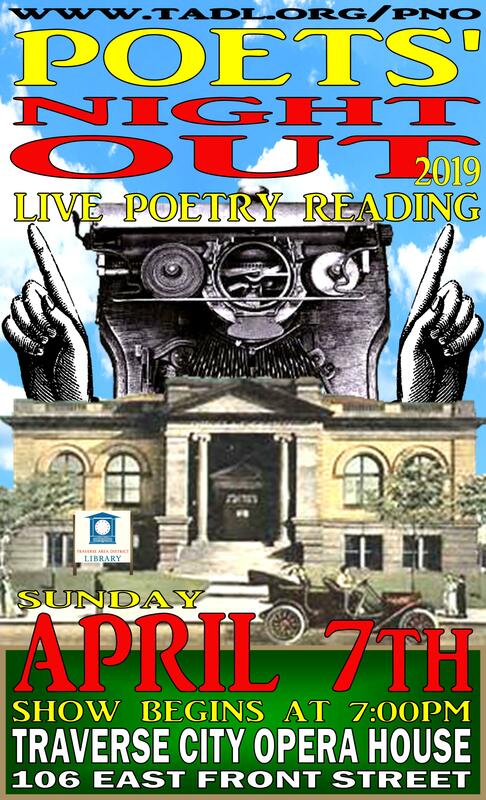 Winning poems are published in the Poets’ Night Out chapbook, and the winning poets will be asked to read their poem at the Poets’ Night Out event at 7:00 p.m. in the City Opera House on Sunday April 7, 2019. Admission to this event is FREE, with general admission seating. Poets’ Night Out (PNO) offers a platform for poets of all ages in our community, professional or amateur, to have an affordable opportunity to become published, to read to a receptive audience and to network with fellow writers. PNO Chapbooks from past years, featuring the original poetry of each year’s winning entries, are available at the TADL Main Library. You’ll find them via the online catalog. For more information visit our website at www.tadl.org/pno If you have any other questions, please e­mail pno@tadl.org or call (231­) 932-­8502.